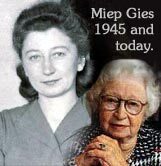 AMSTERDAM – Miep Gies, the office secretary who defied the Nazi occupiers to hide Anne Frank and her family for two years and saved the teenager’s diary, has died, the Anne Frank Museum said Tuesday. She was 100. “I don’t want to be considered a hero,” she said in a 1997 online chat with schoolchildren.